What is a load cell? A load cell is a force sensor device. Some load cells are electrical transducers while some are not. A sensor is a device that detects changes in a physical phenomenon such as force, vibration, motion, heat, pressure, moisture etc. Load cells are load (force or weight) measuring devices and are vital components of several modern-day instrumentation and industrial processes. This technology has improved over the past few decades to replace old weight measurement devices like the Equal-arm balance, steelyard balance, gradual dial scale, Roberval scales and spring scales. The advantages load cells have over all these types of weighing devices listed above has made this possible. An electrical transducer, however, is a type of sensor device that detects these changes in the various physical phenomenon and is able to produce an electrical output signal. This form of an output signal is analog hence it has to be digitally processed to either display the equivalent value of the physical quantity or to be used in controlling other processes through an actuator. Active Transducers:The output energy of this device is supplied entirely by the input signal. In other words, they are self-regenerating and work on the energy conservation principle. Examples include thermocouples and piezoelectric accelerometers. Passive Transducers:These types rely on an external energy source to supply their output power for their operation. The output signal of these devices are variations in the material’s resistance, inductance or capacitance. An example is a strain gauge, a force sensor, as we shall see later on in this article. Each of these load cell types has different parts that are made from varieties of materials. However, for each type, its various designs have common parts of which most are built from the same material. This section shows the detailed structure of some load cell types, their component parts, functions, the device operations and the material in load cells. These types of load cell measure load through pressure hence they are pressure based load cells. A Diaphragm: This diaphragm membrane is made from an elastic material. It can also be a corrugated diaphragm which permits a greater sensitivity and a larger scale of deflection hence they are preferred to flat ones. The corrugated plate materials include stainless steel and phosphor. The Loading Surface or Platform: This is usually a piston designed as a loading platform. The elastic diaphragm is attached to the base of the piston to make contact with the hydraulic fluid. It is usually made from a thick steel material. 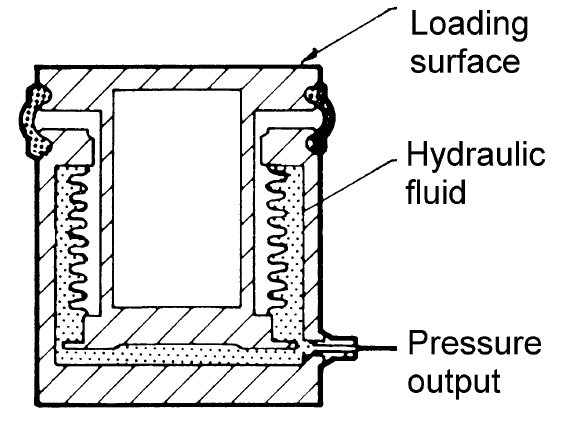 The Hydraulic Fluid: The load cell is filled with either oil or water. A Pressure Output: This might be a bourdon tube pressure gauge as shown in the figure below or a pressure transducer. The bourdon tube is made from materials such as phosphor bronze, beryllium bronze or beryllium copper. The hydraulic load cell is a force-balance device. It uses a piston-cylinder arrangement that uses the hydraulic fluid in the confined cylinder body to transmit a force to the pressure output when the fluid pressure is raised as a load or weight is applied on the loading platform. When the load is placed on the platform, the piston pushes downwards, hence causing the diaphragm to exert a force over its area on the fluid, thereby increasing the fluid’s pressure. Where P is the fluid pressure read on the output, F is the force exerted by the load or weight and A is the cross-sectional area of the diaphragm. Hydraulic load cells have to be calibrated before use. Calibration will involve adjusting the reading to a zero pressure value due to the diaphragm’s pre-load pressure. Use our load cell calibration service for capacities 10,000lbs and below. The device has a capacity of up to 5MN and it is self-regenerating, requiring no external power other than the energy its input creates. It can, therefore, be regarded as a sort of active sensor device (not a transducer as no electrical output signal is generated). However, a pressure transducer can be connected to the pressure output, hence producing electrical signals. Furthermore, its advantages over other types of load cells are that due to its constituent materials, it can be safely used in explosive atmospheres. Also, the pressure output can be located several meters from where the actual device is set up, by improving the design of the fluid tube. The direction of the force it supports can either be tension (tension load cell) or. Compression (compression load cell). These devices also measure the size of a load through pressure. They are pressure-based load cells. An Elastic Diaphragm: This is made of a flexible material or can also be a corrugated diaphragm just like that of a hydraulic load cell. A Loading Platform: This is where the force is applied or weight to be quantified is placed. It is usually a steel piston with the diaphragm attached to its base. Air Supply Regulator: This is located at the bottom of the device or at its side below the diaphragm. It is basically an opening that is regulated by a valve. An Outlet Nozzle: This is also an opening but not directly regulated by any valve. The Flapper or Bleed Valve: This is attached to the body of the diaphragm. Its upward/downward movement opens/closes the outlet nozzle. A Pressure Gauge or Manometer: This indicates the pressure as a measure of the weight or applied force. The pressure gauge is made from materials such as glass, plastics and basic metals like aluminum. Also, alloy materials like brass and steel are used with polycarbonate and polypropylene. 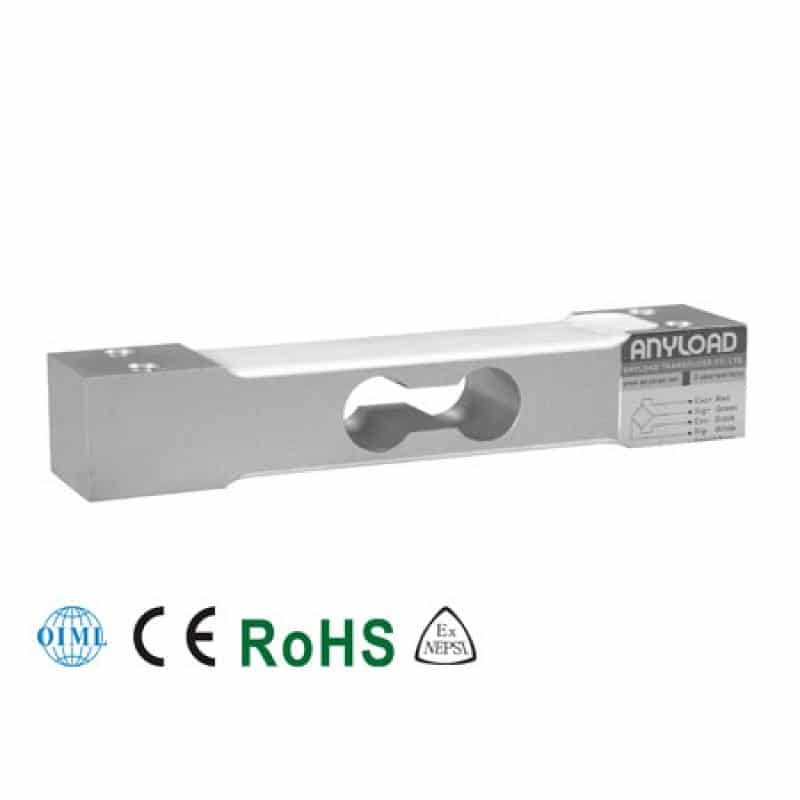 The pneumatic load cell is a force-balance device whose operation relies on the pressure exerted by the force or weight exerted on a volume of air in a confined space. The force is applied to the loading platform to which a diaphragm and a flapper is attached. This applied load deflects the diaphragm and as a result, causes the flapper to move downwards and shut off the outlet nozzle. While this is happening, a back pressure is also acting on the diaphragm thereby producing a counteractive upward force. The resultant of the upward and downward force acting over the area inside the cylinder causes a deflection in the pressure gauge, hence, giving the measure of the applied load. To return the diaphragm to its pre-loaded position, the air supply regulator is turned. It should be noted that this device also has to be calibrated before use and it can hold up to 250KN. It is the most common type of load cell used widely in various industries for a large variety of load cell applications. The Elastic Element: This makes up a large visible portion of the load cell’s body. It is part of the device to which the strain gauge is bonded and it is also called the structural member. 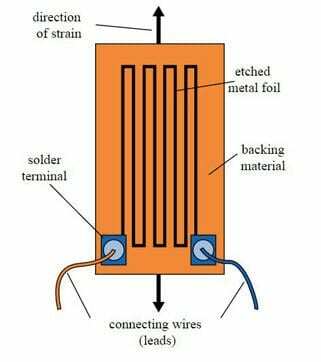 The Strain Gauge: This is the underlying mechanism if the strain gauge load cell. It is called the secondary passive transducer as it actually transforms the strain force on the elastic element to electrical change in resistance. The Housing Unit: This unit serves to protect the electrical components and parts of the load cell from unfavorable environmental factors, especially in industrial areas. It also allows for external fixings like mounting kits to be attached to the load cell for proper transfer of load to the elastic element. When the weight is applied on the load application point (mounting top) of the load cell, the strain is then transferred by the elastic elements along its axis to the strain gauges attached to the beam or structural member (elastic elements). This causes a deformation in the dimensions (length and cross-sectional area) of the strain gauges hence creating an electrical signal at the output terminal of the load cell device when power is supplied to its supply input terminals. In other words, the strain gauge deforms when weight is placed on the load cell. 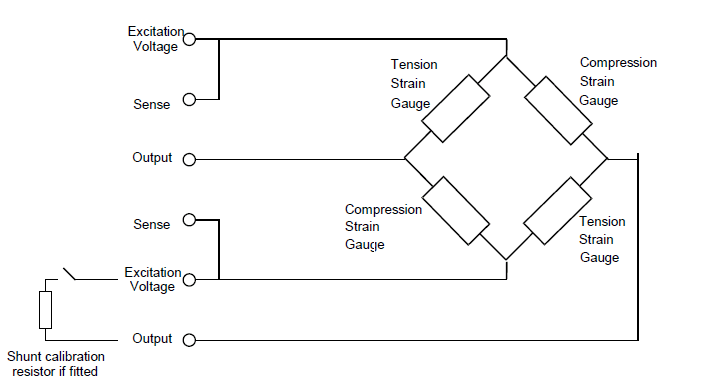 It should be known that the strain gauges are arranged and electrically connected in a Wheatstone bridge circuit configuration. It is the output of this Wheatstone bridge that is the output of the load cell. The Wheatstone bridge has four arms and its configuration depends on the number of strain gauges bonded onto a beam or structural member. A load cell that has a single strain gauge will assume the quarter-bridge Wheatstone configuration. A two-strain gauge load cells assume a half-bridge configuration and a four-strain gauge load cell forms a full bridge configuration. The arrangement of the strain gauge is such that each strain gauge is placed at alternating arms of the Wheatstone bridge. This is to maximize the response of the load. Also, temperature compensation is catered for by using dummy gauges or by designing the strain gauges themselves in a way that they cancel out the effects of temperature changes in them. Each of these materials has properties that make them suitable for use in designing the load cells. These properties are verified by using various testing machines. Few of such properties include high strength, low weight, high malleability, corrosion resistance, good thermal conductivity, good electrical conductivity, high cryogenic toughness, attractive appearance, high work hardening rate, easy machining, low vapor pressure, low viscosity, low coefficient of thermal expansion and low volatility.